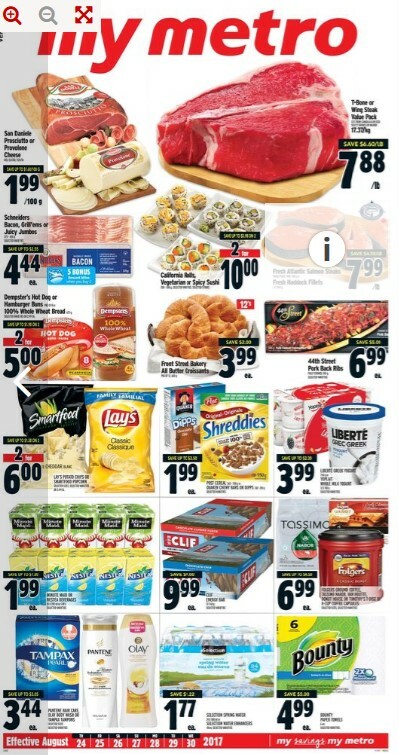 Metro flyer ontario August 24 - 30, 2017 - Find Metro grocery flyer, Metro weekly flyer, grocery store flyer. San Daniele Prosciutto Or Provolone Cheese - Now price $1.99/100 g Up to $1.60 Savings Deli sliced. $9.03/lb. 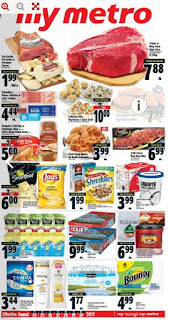 T-Bone Or Wing Steak Value Pack - Now price $7.88/lb $6.60 Savings Cut from Canada AA or USDA select grades or higher. $17.37/kg. California Rolls, Vegetarian Or Spicy Sushi - Now price 2/$10.00 Up to Save $3.98 Selected varieties. Selected stores. 200-300 g.
Post Cereal Or Quaker Chewy Bars Or Dipps $1.99 - Sale Price Up to $3.50 Savings Selected varieties. 365-550 g or 130-210 g.
Liberte Greek Yogurt Or Yoplait Whole Milk Yogurt $3.99 - Sale Price Up to $2.30 Savings Selected varieties. 750 g or 12 X 100 g.
Minute Maid Nestea Beverages $1.99 - Sale Price Up to $1.80 Savings Selected varieties. 10 X 200 ml or 1.89 L.
Clif Energy Bar $9.99 - Sale Price $9.00 Savings Selected varieties. 12 X 68 g.
Folgers Ground Coffee, Tassimo Nabob, Van Houtte, Donut House Or Timothy's T-Disc Or K-Cup Coffee Capsules $6.99 - Sale Price Up to $4.50 Savings Selected sizes. Selected varieties. Pantene Hair Care, Olay Body Wash Or Tampax Tampons $3.44 - Sale Price Up to $3.05 Savings Selected sizes. Selected varieties. Selection Spring Water Or Selection Water Enhancers $1.77 - Sale Price $1.22 Savings Selected varieties. 24 X 500 ml or 48 ml. Bounty Paper Towels $4.99 - Sale Price $5.00 Savings Selected varieties. 6 un. Fresh cut made in your metro Including Muskoka Chicken Salad, Cobb Salad $5.99 - Now Price 252 g. Cobb salad 400 g. Seedless Watermelon Quarters - Now Price $0.69 Product of Ontario. $1.52/kg. Butterfly Fruit Tray, Butterfly Vegetables Tray - Now Price $9.99 1.3 kg. Butterfly vegetables tray 995 g.
Get Cheap Metro flower include : Basil Potted Plants - Price $3.99 6" pot. Sunflower Bouquet Regular Price $5.99 - Price 2/$10.00 5 stems. Hardy Mums - Price $6.99 8". Assorted colours. Intermediate Rose $7.99 Regular Price - Price 3/$20.00 Assorted colours. 10 steam bunch. Ontario Grown Mixed Bouquet - Price $12.99 Assorted varieties. 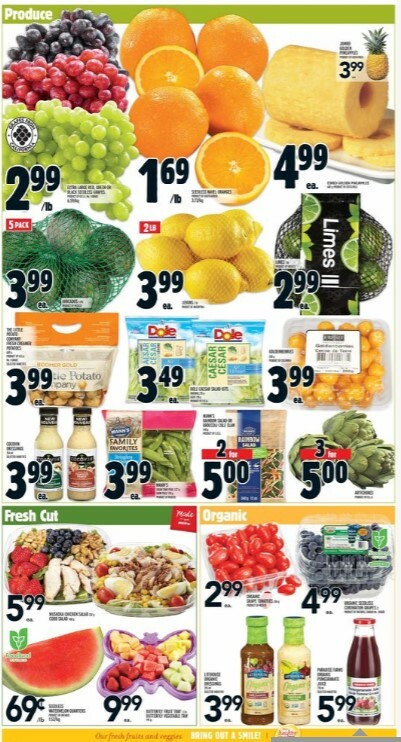 More Metro flyer ontario and awesome deals by Metro grocery flyer. 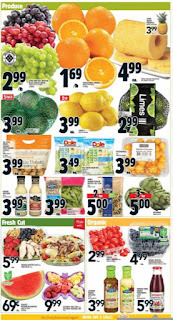 Don’t forget to check out current viewable metro supermarket of all stores Canada.